For those of you who would like to try this traditional pecan pie from Edna Lewis, here’s her oh-so-rich recipe with an optional splash of Bourbon. You’ll have the pecans from your Real Food Box, but you’ll need to check your pantry for a few additional items. For the crust: Place the flour, salt, and sugar on a large cutting board, blending with your fingers. Put butter on top of flour mixture, and use a knife or pastry fold the butter into the flour until the mixture resembles coarse meal -- leaving some butter pieces chunky. About 1/2 of the butter should be cut finely into the flour and the other half left in larger chunks. Quickly gather the mixture into a mound and use your fingers to draw a long trench through the center. Sprinkle 1 TB of the ice water down the length of the trench, and fluff the flour so it absorbs the water. Redraw the trench and continue tablespoon by tablespoon until 4 TB have been incorporated into the flour, and the dough begins clumping together into large pieces. Gather the dough into a mass with a pastry scraper and then use the heel of your hand to knead hunks of the dough in a "smearing" motion, pushing it away from you until the whole mass has been processed this way — about 6 "smears" in all. Then gather the dough together and repeat. Shape it into a flat disk, then wrap in plastic wrap, pressing firmly with the palm of your hand to flatten the wrapped dough further to bind it. Refrigerate at least 2 hours or overnight before rolling and using. Roll out the chilled dough into a circle 1 1/2 inches larger than your pie pan. Line the pan with the dough and trim to leave a 1/2-inch overhang of pastry around the pan. Fold this under, forming a thick edge on the rim of the pan. Mix the eggs, sugar, corn syrups, butter, bourbon, vanilla, and salt until well blended. Prick the sides and bottom of the pie shell at 1/2-inch intervals. 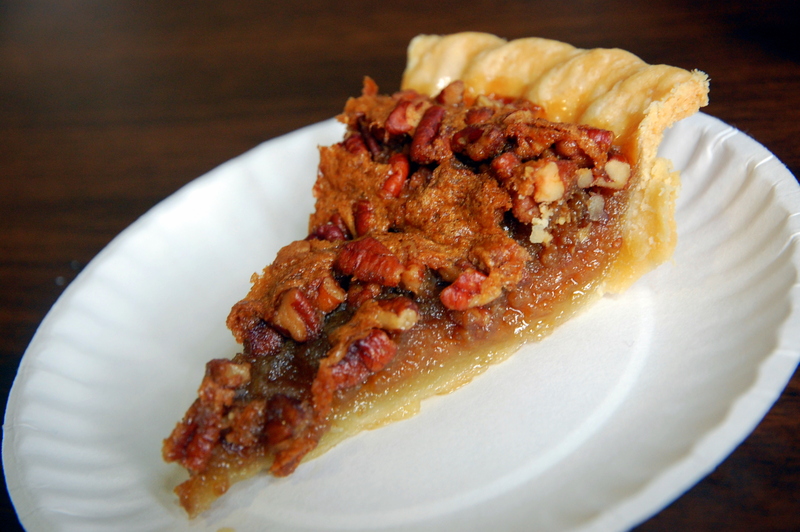 Spread pecans on the bottom of the pastry, and pour the egg-syrup mixture over them. Bake in the preheated oven for 30-40 minutes until just set, but still slightly loose in the center. The pie will finish setting as it cools. This is a bonus recipe for the Real Food Boxes. We have provided only the Pecans, Eggs, and Butter (for the Real Food 3-5 boxes).